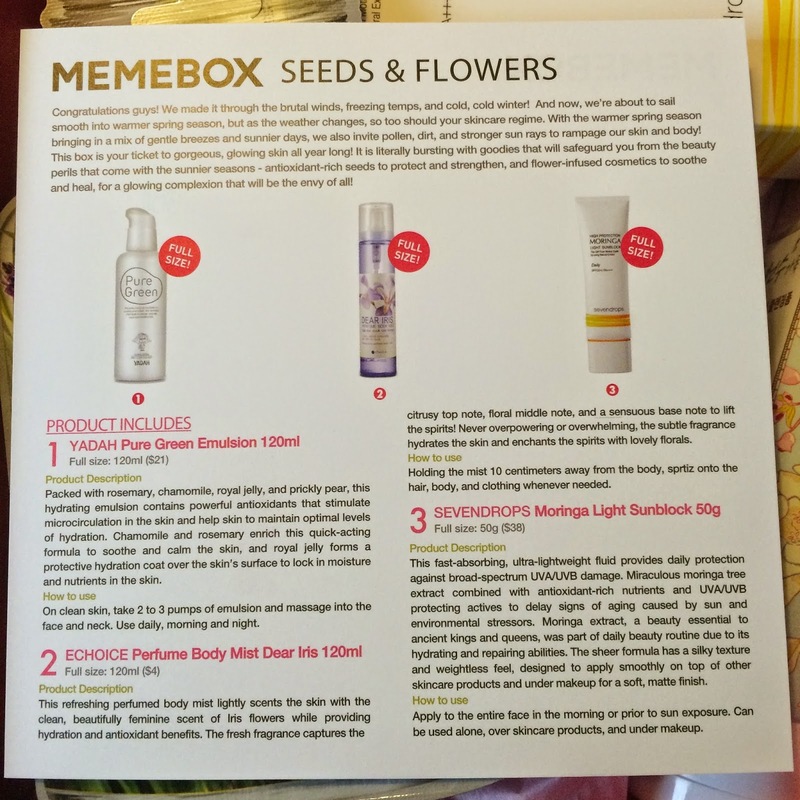 "Seeds & Flowers" was part of a trio of boxes that become the last international boxes available from Memebox. I ordered all three in the hopes that they would be something special and reminicent of the thoughtful and well collaborated boxes that first drew me into Memebox. In this post, we'll take a look at the contents of the Seeds and Flowers box and what I think it looks like as a whole. Congratulations Guys! We made it through the brutal winds, freezing temps, and cold,cold winter! And now, we’re about to sail smooth into warmer spring season, but as the weather changes, so too should your skincare regime. With the warmer spring season bringing in a mix of gentle breezes and sunnier days, we also invite pollen, dirt, and stronger sun rays to rampage our skin and body! This box is your ticket to gorgeous, glowing skin all year long! It is literally bursting with goodies that will safeguard you from beauty perils that come with the sunnier seasons – antioxidant-rich seeds to protect and strengthen, and flower-infused cosmetics to soothe and heal, for a glowing complexion that will be the envy of all! This is a hydrating emulsion that is supposed to improve circulation and contain powerful antioxidants. Chamomile and rosemary soothe and calm the skin, while royal jelly forms a protective hydrating layer over the skin. This actually is the most exciting item out of the box for me, and because it contains alcohol as the sixth ingredient I'm a little afraid to use it. Alcohol tends to break me out and can be drying and irritating to skin as well. This is light perfumed body mist made for not only the body, but hair or clothing too. It is a beautiful light floral scent with mild citrus mixed in as well. This is a fast-absorbing and lightweight fluid sunscreen with UVA/UVB protection. Moringa extract was part of the daily beauty routine of ancient kings and queens due to it's hydrating and repairing abilities. This sunscreen is supposed to also have a matte finish. Sunscreen tends to break me out, so I am very picky with it. After scanning the ingredients list, I noticed alcohol as well, which is also a turn off. I will probably pass this particular sunscreen along to someone else, or I might just save it for summer when I know it will be used quickly. This facial cream is formulated with bulgarian rose, a natural source of vitamin c, to help repair fine lines and discoloration as well as providing continuous moisturization to the skin. I will need to track down an ingredients list before I decide to use this on my face. This rose hip oil infused deep cleanser lifts away dirt and impurities from the skin. It's non-drying and forms a rich creamy lather when emulsified with water to deep clean pores, instantly refresh skin, and give a natural luminous glow. With continual use you are supposed to notice your skin become brighter, smoother, and younger looking. Foaming cleansers are a huge no for me because their high pH destroys my skin. This particular cleanser, however, sounds like it would be very moisturizing and I might just give it a try and report back. Lavender is said to deliver deep nutrition and replenishment to tired, sensitive skin and help maintain a healthy, glowing completion. I am a real sucker for sheet masks - so much so that I have a collection of them! This particular mask, however - like most other PureDerm masks I've seen, is not suitable for blemished skin. I recently broke out from some new skincare items I wanted to try, so this mask has to wait for my face, unfortunately. Overall this is a nice box. I love the products inside, I'm just skeptical of the ingredients. All these products fit the theme of the box nicely! 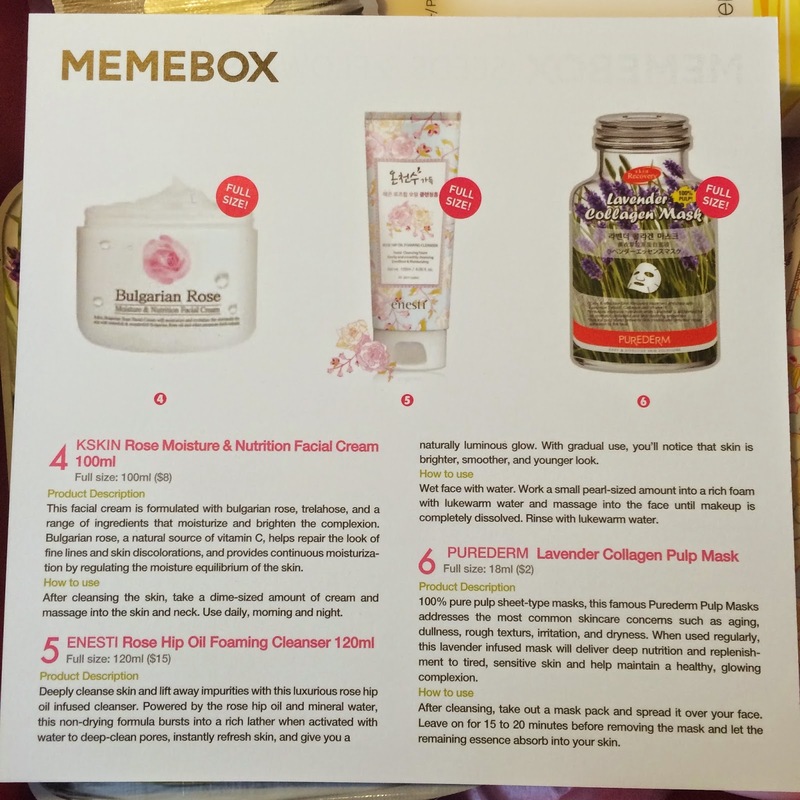 Memebox is the leading Korean beauty retailer, carrying curated boxes & individual items - if you decide to check out their boxes and other products, I'd love for you to use my affiliate link and support future reviews, giveaways, and maintainance of my blog. Disclaimer: The Glitter Chic blog purchased the product(s) mentioned in this post for the purpose of review and evaluation. No monetary compensation was received for this post. The Glitter Chic blog will always provide honest opinions, beliefs or experiences on products reviewed. If you have any questions, please contact me at gothickornchic at gmail dot com. This blog contains affiliate links. The Glitter Chic is not responsible for prize delivery. The disclosure is done in accordance with the Federal Trade Commission 10 CFR, Part 255 Guides Concerning the use of Endorsements and Testimonials in Advertising.